Join Joe McElderry from the musical phenomenon Joseph and the Amazing Technicolor Dreamcoat, and special guests Keith Jack, Lloyd Daniels and Ben James-Ellis, in a night of smash hits performed live from his new album Saturday Night at the Movies. 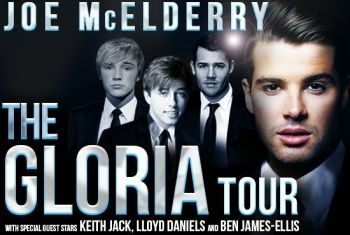 Including the iconic songs; Daydream Believer, Love is All Around, I’m Into Something Good and the hit new single Gloria. Opera & Ballet International proudly presents three stunning productions by Ellen Kent, with international soloists, highly-praised chorus and full orchestra. Verdi’s masterpiece Rigoletto is a dramatic tale of the jester’s daughter whose heart is stolen by a charming but unreliable ruler – and how her father’s attempts to prevent the love affair lead to tragedy (sung in Italian with English surtitles). Next, based on a true story,Verdi’s La Traviata tells of the passionate loves and life of the consumptive courtesan, Violetta (sung in Italian with English surtitles). Finally, one of the world’s most popular operas, Puccini’s Madama Butterfly tells the heart-breaking story of the beautiful young Japanese girl who falls in love with an American naval lieutenant (sung in Italian with English surtitles). From the award-winning producers of Gangsta Granny, comes David Walliams’ amazing tale of frights, fights and friendship, featuring a very large owl, a very small ghost and a very - Awful Auntie! This thrilling show promises to be a total hoot for families. When Stella sets off to visit London with her parents, Lord and Lady Saxby, she has no idea her life is in danger! Waking up three months later, only her Aunt Alberta can tell Stella what has happened. But not everything Aunt Alberta tells her turns out to be true and Stella quickly discovers she’s in for the fight of her life against her very own awful Auntie! Dance like you’ve never danced before! FLASHDANCE - THE MUSICAL tells the inspiring and unforgettable story of 18 year old Alex, a welder by day and ‘flashdancer’ by night, who dreams of going to the prestigious Shipley Dance Academy and becoming a professional dancer. Based on the iconic 80s film, Flashdance is an exciting musical about the power of holding onto your dreams and love against all the odds. Prepare to be blown away with an astonishing musical spectacle and phenomenal choreography to this smash-hit score including Maniac, Manhunt, Gloria, I Love Rock & Roll and the sensational title track Flashdance.